NuCurrent, a leading wireless power system and magnetics solution provider, announces the launch of its “Q15 line” of Qi-compliant smartphone antennas at the CES 2018 in Las Vegas. Immediately available, the 15-watt antennas, designed for fast-charging, next-generation smartphones, are the industry’s thinnest and most efficient. "Now that wireless charging on the Qi standard has been broadly adopted in the smartphone industry, the path forward is towards a better user experience with faster, more efficient charging,” said Jacob Babcock, CEO, NuCurrent. “NuCurrent’s patented MLMT technology has been at the forefront of wireless charging technology in today’s smartphones. The ‘Q15 line’ is the natural next step in the evolution of the technology." Smartphone manufacturers are now able to take advantage of the design flexibility afforded by the new NuCurrent antennas, which are the thinnest in the industry and are available on flexible printed substrates. With an antenna thickness of only 0.20 millimeters, smartphone manufacturers can now offer more efficient and faster wireless charging while keeping form factors extremely thin. Based on NuCurrent testing, wireless charging rates for current smartphone models tops out at 8 watts on Samsung devices and 7.5 watts on for Apple devices. For phones that incorporate NuCurrent’s 15-watt antennas, users will get more power to their batteries in a shorter period, resulting in a superior wireless charging experience. To learn more about the new “Q15 line” of Qi-compliant smartphone antennas, please contact info(at)nucurrent(dot)com or visit http://nucurrent.com. 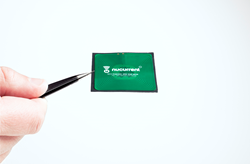 NuCurrent delivers breakthroughs in wireless power through its expertise in magnetics and full-system integration. The company’s core technologies include its patented MLMT antennas - which are the industry’s thinnest and most efficient (highest Q) - along with proprietary software that accelerates successful wireless power solution development through advanced hardware simulation and firmware control. NuCurrent’s engineering team applies these core technologies in partnership with client product teams to produce complete wireless power solutions on the Qi and Airfuel Standards and within closed, proprietary systems. Founded in 2009, the venture-backed, Chicago-based company has over 65 patents granted or pending worldwide. For more information, visit http://nucurrent.com and follow us on Twitter at @NuCurrentTweets.